As promised, we delivered 6 bikes to Kalingalinga volunteers first thing in the morning! We loaded the bikes into a hired truck and made the short drive to the clinic. Mary Kaumba and Leah C from the Ministry of Health accompanied us for the delivery. After getting permission from the Sister-in-charge and the volunteer coordinator, we unloaded the bikes to a collection of volunteers. 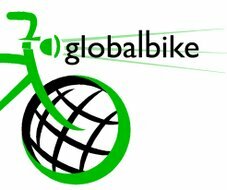 Globalbike gave 6 bikes to a collection of 10 volunteers at this clinic. They were very eager to try out the bikes and take pictures with their bicycles! I spent a few minutes talking with each of the volunteers--Emson, Eness, Jennipher, Matthew, Bridget, Christina, Riebeck (I think his name is so cool! ), and Maureen. We were making quite the scene, even overshadowing the arrival of medical students from the University of Zambia. People gathered around the parking lot to watch the procession of bikes and attempt to jump into pictures. As the other partners had decided, Valid International decided the volunteers with the most experience and travel the furthest would be the first to receive the bikes. The volunteers have zone areas surrounding the clinic that they cover. They are asked to make visits for at least two hours a day after the nutrition clinic in the early morning. Majority of them spend many more hours beyond that everyday going to visit defaulters, most of which is spent walking. I may seem as a broken record at this point but these bikes are crucial for making the volunteers' time more effective in serving the community. Think of when you were a kid and wanted to go play at a friend's house--how did you get there? There's no way you would walk to the other side of the neighborhood even if it was your best friend (I say 'you' because I just ran there...). You grabbed your bike and pedaled over there to to make sure you could spend as much time there before it was time to come home for dinner. The same principle works here: the volunteers need to be able to spend as much time with the defaulters they visit to ensure the mothers understand that their attendance along with the child's is important. They need to know someone in the community cares and wants to help their family; this can't be communicated in just a 5 minute visit like we get with our family doctors in the States. Just as a reminder, a 'defaulter' is a mother who has been absent for three consecutive nutrition clinic/workshops. The volunteers go out to visit them to see about the condition of the child and ensure the mother has stopped attending because the child died. In the process of going into the community the volunteer careworkers will also look for other malnourished children that may need to be admitted into the nutrition program. Therefore, the community careworkers are crucial in preventing the death of children in the community. Once we got there, I realized that this was not far from Jen's house. Literally a 10 minute run from the lush American style ranch I was living was this cement hut. The income disparity of developing countries like Zambia was never more apparent than this. Mary accompanied us to the house where we sat outside in between clothes lines covered in laundry. I met an 18month old girl Eveylyn and her mother. After a short discussion about the child's health, Mary inquired as to why the mother had defaulted. She said that she attended a funeral one week and then stayed in the village for awhile before returning. And this morning? Well she didn't have laundry powder the other day but had some this morning so she wanted to do the laundry. Mary was quick to chastise her saying that she could have come to the clinic early in the morning and returned to get the wash done. visit mutendere and walked street market wth yvonne--caterpillars! saw a child being taken from the ward to the hurse. The child had died from malnourishment. The child had died while I was talking with another mother about why she hadn't brought her child to the clinic since June. What?! Then a thirteen year old walked in with her 18 month old child. A thirteen year old girl. 18 month old child. My heart sank. the girl can't read and is too ashamed to go to school anymore. My stomach churned. Even after that Big Stuff, I didn't feel depressed or disappointed. These images have become the reminder why I must earn my Masters in Public Health and MD. I have to come back to Lusaka. I want those children to be playing with Grassroot Soccer in a few years not leaving a ward with their mother wailing. It was a necessary reminder as my last day in the field in Zambia before I head back to Wofford for my final semester. There is a reason I am in college. There is a purpose beyond the diploma. Hey!Just saying hi and comment later when reading will be done...my mom found the site and I remembered to tell u about a movie more U might enjoy, since we know lots of movies :) "Happy go lucky" and maybe this one as well http://vimeo.com/7679731. Still enjoying below the "0" line?